3 Stocks with Better Dividends Than Procter & Gamble Co. It's one of the longest-running dividends in the market, but income investors can do better. 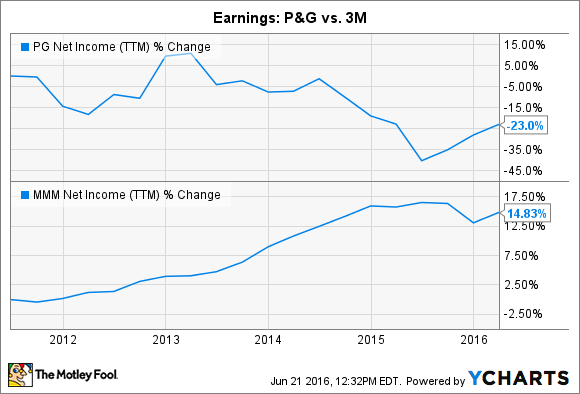 Procter & Gamble Co. (NYSE:PG) surprised income investors this year -- and not in a good way. The consumer goods titan raised its dividend by less than $0.01 per share, equating to a 1% payout boost, its smallest in recent memory. The increase pushed P&G's streak of consecutive annual raises to 60, but didn't inspire a lot of confidence in future dividend growth. Given this, here are a few comparable companies for investors to consider. Wal-Mart (NYSE:WMT), Johnson & Johnson (NYSE:JNJ), and 3M (NYSE:MMM) all have slightly lower yields, but their dividends look set to outpace P&G's over the next few years. Data sources: Company financial filings and S&P Global Market Intelligence. Chart by author. It's been over a decade since P&G introduced a hit new product that's worth over $1 billion in annual sales. That's a big deal for a company that counts creativity as its core competitive advantage. "Innovation has always been -- and continues to be -- P&G's lifeblood," executives explain in their 10-K report. P&G's biggest brands. Image source: Procter & Gamble. The company can make all kinds of positive financial and strategic adjustments, but until it raises the bar on category-shifting products, organic growth is likely to lag rivals. Johnson & Johnson, meanwhile, has no problem in the innovation department. A quarter of its sales come from new products launched in just the past five years, and the $9 billion it spends on research and development keeps that pipeline stacked with releases across its pharmaceuticals, medical devices, and consumer products divisions. A slump in Wal-Mart shares has pushed its dividend yield to near-record highs for the stock. Many investors are staying away as new spending on stores and wages pinches profits. In fact, consensus estimates call for a 7% drop in the retailing titan's earnings this year. Still, Wal-Mart's payout ratio, at less than 50%, trounces P&G's, which is only expected to fall to 70% in 2016 from over 100% last year. Both companies are likely to post similar growth rates over the next few years. 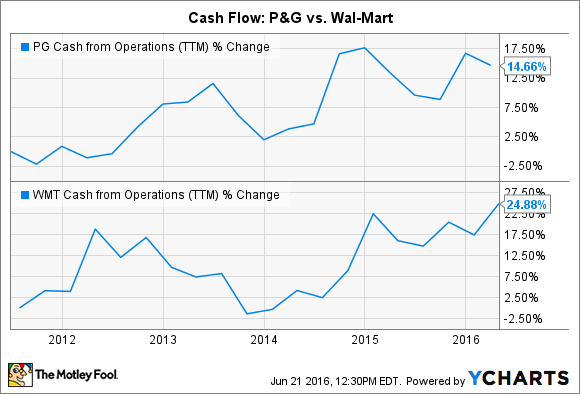 Wal-Mart is, after all, P&G's single biggest customer. In that context, income investors might prefer cash flow strength over projected earnings growth, since that's what will ultimately fund future dividend boosts. Industrial and consumer goods giant 3M is expanding at a pace similar to P&G. Both companies expect to book meager organic sales gains of about 1% this fiscal year. However, 3M's profits are rising at a much faster clip. A long-running boost in profitability has helped push net income up by double digits over the past five years, compared to a 20% slump for P&G. PG Net Income (TTM) data by YCharts. That profit-growth gap helps explain why 3M could raise its dividend by 8% this year and by 20% in 2015. Its low payout ratio also suggests that management can keep up the market-beating raises from here, even if sales growth stays sluggish. P&G investors can't say the same thing about their dividend, even though cash returns to shareholders are set to climb between now and 2019.